Dr Azeem Ibrahim is Executive Chairman of The Scotland Institute, Chairman of The Ibrahim Foundation, a Fellow and Member of the Board of Directors at the Institute of Social Policy and Understanding and an international advisor on policy issues. His commitment to relentless goal setting and challenges led him to a seven-year commitment as a reservist in the IV Battalion Parachute Regiment — the British army’s elite airborne infantry. An equally intense passion for education earned him three Master’s degrees and a PhD in Geopolitical Strategy from the University of Cambridge. A gifted and respected counsellor, he has offered strategic advice to a number of world leaders, on topics ranging from anti-radicalization to improving social mobility and national competitiveness. The academic world has taken notice of his accomplishments. Glasgow Caledonian University honoured him with an honorary doctorate. He received appointments from institutions as prestigious as Harvard University where he served as a research scholar at the International Security Program at the Kennedy School of Government. He was selected as a member of the University of Chicago’s Harris School of Public Policy’s Dean’s International Council and as a member of the Board of Directors at the Institute for Social Policy and Understanding. 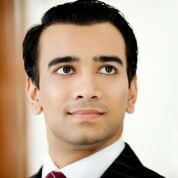 Yale University chose him as an ‘Emerging World Leader’ as part of their World Fellows Program. The World Economic Forum named him a ‘Young Global Leader’ and the LSDP European Social Think Tank tapped him as a ‘Top 100 Global Thinker’. Azeem’s columns are regularly published around the world, and can be read in Foreign Policy, The Scotsman and the Sunday Herald, The Middle East Times, The Huffington Post, Chicago Tribune and the LA Times. Azeem devotes much of his time to his own charities. In addition to his community grant-giving foundation – the Ibrahim Foundation – he has founded charities that tackle problems as diverse as family and marriage breakdown in Scotland and providing clean drinking water in disaster areas. Some cultures refer to teachers as nation builders and see them as higher beings. The Global Teacher Prize was founded to universalize such ideas. I'm excited to join the movement of teacher champions and shout 'teachers matter'!